Total time: 45 minutes, plus pasta cook time. No longer on the menu at Olive Garden® is my absolute favorite entree from this restaurant. Lucky for all of us, Olive Garden® has always been happy to share their recipes for everything. This was pulled from their website before the menu item was removed! Menu Description: Grilled beef medallions drizzled with balsamic glaze, served over fettuccine tossed with spinach and gorgonzola-alfredo sauce. 1. Grill steak to preferred doneness. 2. Cook 1 pound pasta according to the directions. 3. Place drained pasta in saute pan with heated sauce. 4. Toss pasta with sauce and place on a large platter. 5. 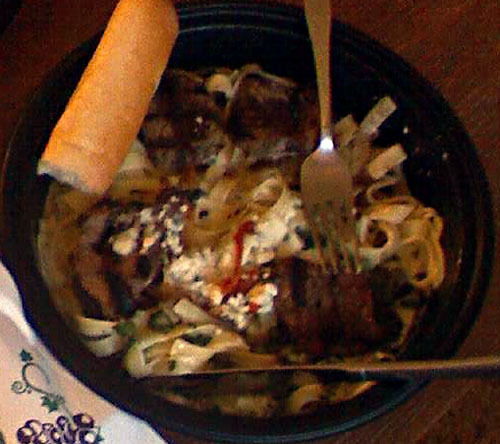 Place grilled beef on pasta and sauce. 6. Drizzle with balsamic glaze, and sprinkle gorgonzola cheese and sun dried tomatoes. 3. Add the marinade to the beef, toss, and let marinate for at least 1 hour. 1. Heat Alfredo sauce in a large saute pan. 2. Add onion, spinach and gorgonzola cheese. Simmer until thickened, cool to room temperature. Mix together ingredients in saucepan and bring to a boil. Simmer until mixture thickens slightly and becomes syrupy, whisking often, about 15 minutes. Pick your glaze or make a combination of both. We skipped this altogether when we made it the first time. We also used our own alfredo sauce.